Need a quick 4th of July decoration update? We have a quick and easy way to spruce up your porch (or any other area that needs some 4th of July vibes). The best part? Most of these things you will have hanging around your house. Take a pillow and wrap it in a bandana like this. Fold both sides in first, then the top and bottom sides and tie them together to make an adorable new patriotic pillow! For other pillows that aren’t small enough for a bandana to be folded around, you can use two bandanas on each side and use little hair elastics to secure the corners together. Now, to make the easiest banner you’ve ever made, go find some scraps in your craft room (or if you don’t have scraps, go to your mom or your grandma. They’ll hook you up.) and start ripping them into squares or rectangles! We did ours about 6 1/2 x 8 1/2, but you can do what works for you. Once you’ve ripped one, lay it on your next scrap and make it the same size as your first one. No measuring or cutting? Score! You then should iron all your scrap squares to make them look a little nicer, but since you tore them they still have a cute shabby look. And you’ve got yourself a 5 minute banner! If you have any pots on your porch, stick some dollar store flags in there, hang your banner, and throw those pillows. You can also do this anywhere in your house if it doesn’t work for your porch. 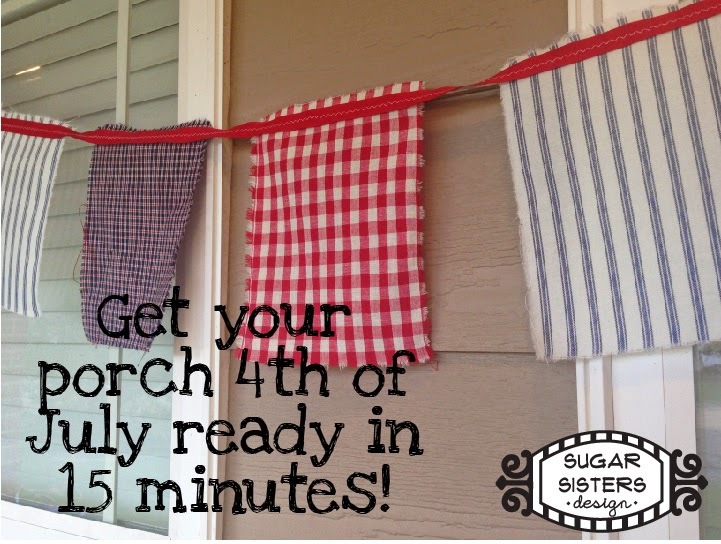 Hopefully those will help those of us last minute people get a little 4th of July inspiration to throw something together! Hope everyone has a great holiday!